I’m about half an hour early in celebrating the release day for this book, but just couldn’t wait for it to be officially June 8th. 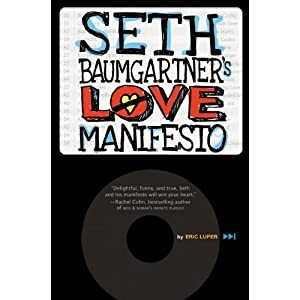 For starters, SETH BAUMGARTNER’S LOVE MANIFESTO by Eric Luper is one of the funniest books I’ve ever read — snorting, laugh-out-loud, funny. But what makes it even more terrific is that the humor is mixed with drama, hope, and the kind of heartbreak that only comes with being a teenager in love. Poor Seth is having a rough day when the book opens. His girlfriend has just dumped him during her dinner break from work, and across the restaurant, he’s just spotted his father on a date with a woman who is most definitely not his mother. The fact that all of this happens at Applebee’s somehow adds to the sting. As Seth nurses his own relationship wounds and tries to get to the bottom of the mystery surrounding his father’s…(mistress? Is that what she is? )…he decides to explore the very nature of love itself by starting his own podcast on the topic. The podcasts are as witty and insightful and wonderful as the perfectly imperfect characters in this YA romantic comedy. It is just all-around brilliant and great fun, too. And did I mention there’s golf? And really bad chicken salad sandwiches? Eric is one of my writing critique partners, but I’d love this book whether I knew him or not. It’s one of those YA novels, in the spirit of John Green and David Levithan, that both boys and girls are going to love. Available today (yay!!!) from Balzer and Bray, an imprint of HarperCollins. And one more note…Eric is running a very cool contest to celebrate Seth’s arrival in the world. You can win books, audiobooks, an iPod shuffle, and great things like that. Click here for information on how to enter. This entry was posted in Uncategorized and tagged book review, eric luper, seth baumgartner's love manifesto. Bookmark the permalink. Both comments and trackbacks are currently closed.